I guess one thing that made it especially painful last year was the approaching wedding day of my daughter. It was only 4 days until her wedding day, and I really could not afford to fall apart since I was her wedding planner. There was also no one to talk about it, not that I would have had time for it. After so many years no one in my family remembered this anniversary. Today I am grateful I didn’t have time to dwell on that part of my past last year. One thing I have learned over the last 18 years of being single again is, it doesn’t help anyone when I spend a lot of time on my past. I miss out on living in the present. In 2004 I made a very conscious decision to commit the rest of my life under God’s guidance. I came to the end of myself, and I knew I just could not do this on my own anymore. Being a single mom of three upcoming teenagers was taking its toll on me. I was so unhappy with my life, and I watched it influencing my children. My moods, my angry outbursts, they were all contributing to everyone’s misery. My health was failing, and not just my physical, but also my emotional. 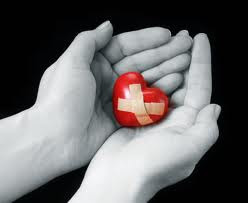 No amount of pills would fix a heart that was still broken, still shattered. I realized no human being would ever be able to help me. I had to turn to the Only One who was and is able to heal. I remember the day I prayed to God to take all the pieces of my shattered heart and heal them. I told God that day He could have it all, my past, my present, and my future, the good, the bad and the ugly! I had no idea what that would mean for me, for my children. But you know, I’ve discovered God honors our sincere prayers. I cannot begin to tell you what a wild ride it has been since I prayed that prayer! I am living proof that God is in the business of healing and restoring. And not just that, no, He is all about giving us a new heart, a new life! I could have never imagined the life I’m living now. I’ve been healed and restored above and beyond my wildest imagination. Once I started reading the Bible and praying regularly, God opened up a whole new dimension to life! I became alive like never before. I began to live, to reallylive! I don’t have to carry any heavy burdens anymore. I leave them by faith prayerfully at Jesus’ feet. I am no longer walking this road alone. That’s HUGE to me! “I know the LORD is always with me. So here I am 26 years later… It’s still me, but then again, it’s not me. I’m so different since that life-changing prayer in 2004. There is a fire burning inside me and a passion to discover more about God and Jesus. Since I know what a difference a life surrendered to God makes, I am passionate to see this change happen in others. I love to see others catch that fire and realize that God can be the center of their lives as well. Are you ready for a wild ride? One promise I can give you: Jesus will never disappoint! N.E.V.E.R. What Forces You to Look Back? Meggie, thanks for sharing what was a painful time for you but then giving God control of your life is a testament to me and everyone around you of an awesome & faithful God and a you a faithful servant triumphant! Blessings to you Lily H.